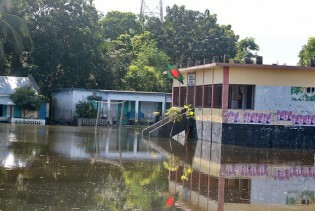 Bangladesh is a disaster-prone country with floods hitting almost every year, leaving a trail of destruction despite having early warning systems. Now experts say it is time for the delta nation to think more seriously about how to deal with the recurring onslaughts of floods more effectively by strengthening its flood defence. Life for Bangladesh’s rural people, particularly in its remote north, is still miserable. Seasonal flooding, river erosion, and the low quality of rural infrastructure and lack of connectivity have made things harder for poor northerners. Breaking taboos surrounding menstruation, a project to distribute sanitary napkins to girls in one district of Bangladesh has had a positive impact on school dropout rates – and should be replicated in other parts of the country, experts say. Journalism is a profession that attracts both sexes, but social taboos and hostile office climates have kept the numbers of women working in Bangladesh’s media sector dismally low. Still, a new generation of women is stepping up, with the support of their path-breaking colleagues. The Palli Karma Sayahak Foundation (PKSF), a public sector apex development body in Bangladesh, and Inter Press Service (IPS), the international news agency focused on development issues, have teamed up to raise public awareness globally about PKSF’s best practices and provide vital information to decision-makers. Experts at Bangladesh’s National Water Convention 2016 in Dhaka urged the sustainable management and conservation of water as the country braces for a water crisis due to wastage, river pollution, declining groundwater tables and intrusion of salinity. Pumping money into development projects and rolling them out without having a good communications policy in place makes it unlikely the programmes will achieve their desired goals, as communications is vital to connect with stakeholders. Though highly hopeful about achieving the U.N.’s Sustainable Development Goals (SDGs) well ahead of the 2030 deadline, Bangladesh is upset over the procedures to access the Green Climate Fund, calling them ‘ridiculously complex’ and warning that they may slow down its drive to achieve the SDGs. Amid growing persecution by Myanmar's military, thousands of minority Rohingya Muslims in its western state of Rakhine have fled their frontier villages and are languishing along the Myanmar-Bangladesh border for lack of shelter and emergency supplies.